An outstanding HD video and automatic photo camera with built-in GPS for paddlers, bikers, surfers, kite boarders, hang gliders, hikers; all of us that love the outdoors! I take mine on every adventure. 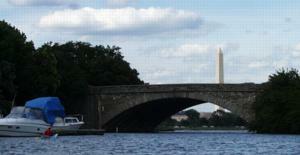 Route 395 to Arlington and Pentagon City on the west side of the Potomac River. Exit onto George Washington Memorial Highway southbound. Facilities: restroom, picnic tables, linear park for walking, jogging, biking, or roller blading running beside the river. The Boundary Channel is a pocket of quiet, no wake paddling in the heart of Pentagon City. The channel forms Columbia Island on the west shore of the Potomac. The launch point itself was unusual as jets flew over head to land on the end of the runway immediately to the south. 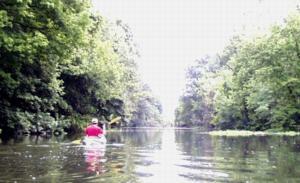 Paddling the Potomac isn't quiet, but it is impressive. There is a lot of weekend launch traffic at the ramps, so we organized out boats on the adjacent grass to launch quickly. When we returned, we got out onto the floating docks and avoided the ramp traffic altogether, though that may require more effort for some than the ramp launch. 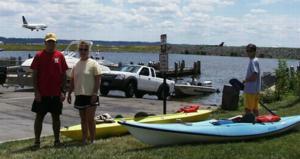 We kayaked east from Gravelly Point Park, then north (left) onto the Potomac along the west bank. In the morning, the river was fairly calm, though the wind was already building. About 3/4 mile up the river, we passed the first 3 bridges (not particularly scenic yet). Just north of these bridges, we entered the south entrance to the Boundary Channel that parallels the Potomac to Teddy Roosevelt Island. (see photo at left). We could see the Pentagon at the far end of the channel past the Columbia Island Marina docks. 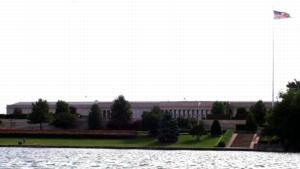 As we kayaked, the first striking view is the Pentagon at the west end of the channel where it turns to the north. This perspective of the building is beautiful, with well manicured gardens and a large flag overhead. I wouldn't be surprised if the bottom of this water way has seen it's fair share necklaces, watches and even a few tungsten wedding bands. As we paddled north, the Boundary Channel became more natural looking, though we could always here the sounds of capitol traffic and flights overhead. We found the channel to be a nice way to bypass this portion of the Potomac when the water becomes rough on the river, though you'll still have to negotiate the river for the last mile back to the Gravelly Point Park entry. It may also be possible to launch from the Columbia Island Marina. The Boundary Channel's northern entry ((photo at right) emerges just west of the south end of Roosevelt Island. You may choose to take the Potomac northward and the Boundary Channel on your return to the south if the river becomes rougher later in the day as it did when we paddled.